On this blog, we generally recommend dry dog food when people ask about it. That’s not because wet food is any worse than dry food. Mostly, it’s because it’s considerably more difficult (in our opinion) to find a good canned dog food with the kind of nutritional profile we look for in a good dog food. So check it out. We’ll cover the pros and cons of wet dog food—just so you know what you’re getting yourself into—and then we’ll give you a few specific recommendations that you can try right away. 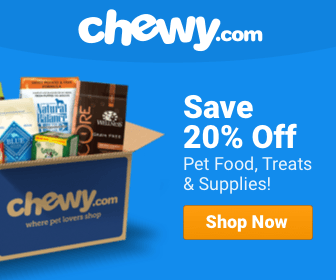 What Are the Benefits of Canned/Wet Dog Food? Like I said, we generally recommend dry dog food here. But that doesn’t mean that there’s a lot to gain from a great wet dog food. Our pup's had plenty of canned dog food in her day, and she still gets it now and again if we feel like giving her a special treat. Here are some of the primary benefits of choosing a wet dog food. Canned food hydrates your dog. Some dogs just don’t drink as much as they should. Who knows why. Our dog is one of those dogs. I always have to keep my eye on her to make sure she’s getting enough water. Most of the time, she gets just enough. And that’s okay. But it also means that when she gets sick (e.g. vomting or diarrhea) she gets dehydrated really easily. The last time that happened, the vet had to inject water under her skin just to make sure she didn’t keel over. Pretty scary! Canned dog food contains a lot of water, since it requires a lot of water to process. That can make it tough to read the nutrition label accurately, but it also makes it an excellent source of water for dogs who have trouble staying hydrated. It smells better to your dog, anyway. To us humans, it usually just smells stronger. And that’s good for a number of reasons. First, it’s just a nice thing to do for your dog. Who doesn’t want to see their dog’s little face light up when you plop down that smell bowl of dog food?! However, it’s also great for older dogs who are losing their sense of smell. A more pungent dog food might make them more inclined to eat, which can keep them healthier for longer. Dogs can also lose some of their sense of smell when they get sick. So having a food with a stronger smell can help keep them from getting malnourished. Really, your dog may not even have to chew it at all. This is mostly for the senior dogs out there—and in particular the ones who’ve lost teeth. Kibble can be both difficult and painful to eat if your dog’s lost a few teeth. Switching to a canned dog food can make it much easier for him to eat. This is a no-brainer. Wet dog food is just a whole lot messier than dry dog food. It gets stuck to the food bowl. It sticks to your hands. It sticks to your dog’s face. It sloshes onto the floor. Along these same lines, to some people, it’s just gross. I don’t have this particular problem, but my fiancé absolutely cannot stand the sight or smell of canned dog food. And if it’s something you have to interact with first thing in the morning, that’s a major downside. It’s not great for dental health. Canned food may not be the best choice for dogs who are predisposed to dental problems. Wet dog food tends to stick to teeth and get trapped in a dog’s gums. This can lead to more bacteria and more decay (which is why dogs who eat wet food commonly have worse breath than dogs who eat dry food). This isn’t a deal-breaker, really. It just means that if you’re going to go with canned food, you’ll have to be extra careful with your dog’s dental care. If this is the type of food you want to feed your pup, you’re going to have to be on a schedule and so is your dog. You can’t just leave this stuff in a food bowl for a few hours. It spoils really quickly, and if your dog doesn’t eat it quickly, it could make him sick. Plus, you have to refrigerate it, which is kind of a pain. Once you crack that seal, you’ve got to use it or lose it! For whatever reason, canned dog food tends to be more expensive than dry dog food. And it can be even tougher to find a good quality dog food that doesn’t totally break the bank when you’re buying a bunch of it every week or month. It often doesn't contain enough fruits and vegetables. I have no idea why this is the case, but I’ve found it to be true. 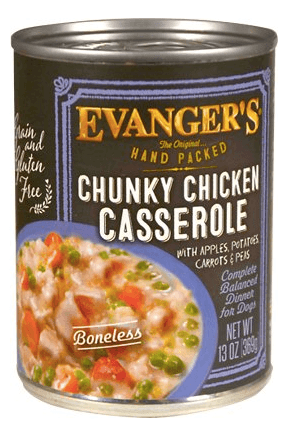 Lots of canned dog foods, even from brands I really love, contain almost no produce at all. That’s why we’re recommending the foods we are below: they’re good overall, but they contain lots of good fruits and veggies, which makes for better overall health (in my opinion). It’s up to you! Wet canned dog foods provide lots of great benefits, and we still feed them to our pooch every now and again (mostly when she’s sick or we want to give her a special treat). But I imagine we’ll incorporate them more into her diet as she gets older and we want to make sure she can chew well and stays hydrated. As always, though, the best advice will come from your vet. 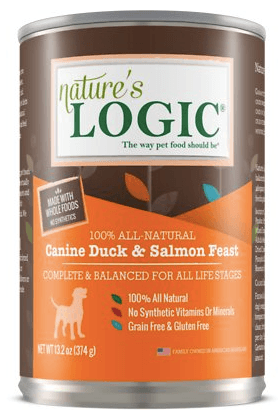 We like Nature’s Logic dry dog foods, so when we started really looking for a good wet food, they were one of the brands we tried first. One of the things we really like about this stuff is that it’s got a high protein content (about 44%). That protein mostly comes from duck and duck meal, which is also a pretty fatty, gamey meat, which gives this food a nice flavor (according to our dog). What I really like, though, are all the great fruits and vegetables. It’s got apples, apricots, artichoke, blueberries, cranberries, broccoli, carrots and a bunch of other stuff. There are also very few chemicals here. So this is a good one. Our pup loves the taste (even if the smell is a bit strong for me). And it’s got lots of great ingredients. This is another good dog recipe with something we generally really love when looking at a dog food: fish as the main and only ingredient. We like to see fish in dog food because it’s got tons of great protein and tons of great fats. It’s just a good one-two punch. 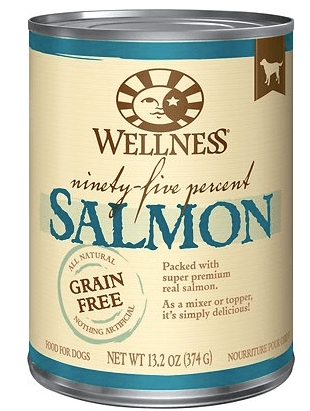 Since salmon is pretty much the only ingredient here, it's obvious this food is grain-free and a perfect option for pets who need limited ingredient diet. Overall, this is a good dog food, and we recommend it. Holy crap. What an amazing name. Honestly, if I wasn’t a human, I’d be all over this stuff. It’s a casserole! The great thing about this food is that if you read the nutrition label, but whole first couple of lines is just meat and vegetables. It’s got chicken, chicken broth, carrots, peas, apples, and a few other great sources of vitamins and minerals. By the way, why don’t more dog food companies use broth instead of water? Very cool, and a good way to get in some nutrients. Plus, the protein content is 44%, which is nice and high. It’s a good one. 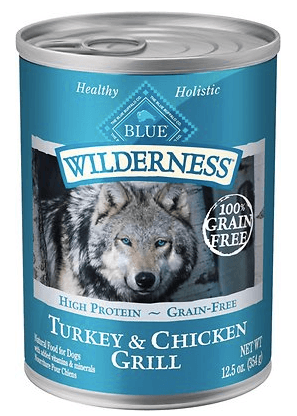 We recommend Blue Buffalo a lot, but we have to be honest here: we’re not as absolutely gung-ho about their canned food as we are about their dry food. And that’s mostly for the same reason we don’t like a lot of wet foods: there’s just not many vegetables. In fact, there are no vegetables to speak of. That said, Blue Buffalo still has high quality ingredients and plenty of protein (46%). We just wish they’d included some more stuff you might find in a salad. Still, it’s a good brand, and a good option if this isn’t the only food in your dog’s diet. 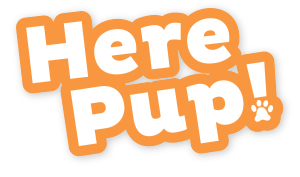 If you like this article, we have a good one on puppy food you might want to check out as well. Or, take a peek at this one on dog foods that can help your pup lose weight or this one on good food for large dogs. Lastly, take a peek at this grain-free nutrition guide. I walk my dog every morning with a friend who is a retired veterinarian and with a PhD in human pathology. She regularly points out that dogs’ teeth are not meant for chewing–they are meant for tearing food apart. The food is then swallowed and digested. Dogs have 4% acid in their stomachs compared to I think 1% for humans. This is why dogs seem to be able to digest some tough things. This is also why it is amazing that many vets actually tell clients to give dogs antacids when their stomachs are upset. Dogs (Wolves) do not eat dry food in the wild, other than incidental intake as they are eating the stomach contents or meat of prey they have just killed. It is amazing that dog food companies–who have vets on staff and know this for themselves–continue to produce dry dog food. I believe in feeding animals consistent with their consumption in the wild–and dry food is not that. Dry food is strictly for the convenience of humans. I have fed my dog small bites Nutro for 4 years and mix the canned Nutro into it. Now Nutro discontinued the canned food and changed it to grain free. I’ve tried slowly mixing in the grain free, but he has never been able to eat grain free it gives him diarrhea. What is a good canned dog food that’s not grain free? try the Ideal Balance wet recipe by Hill’s. It’s tailored for sensitive digestion, thus your pup unlikely would have diarrhea because of it.